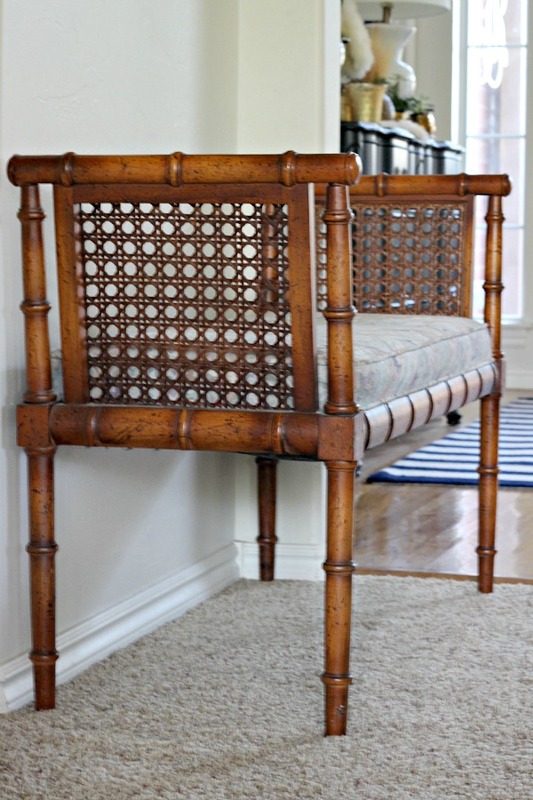 I shared this little Craigslist bamboo bench with you last year. I wasn't sure what I was going to do with it when I purchased it, but I knew I couldn't pass it up! It's shown up in a few pictures here and there, but was hiding a little secret. 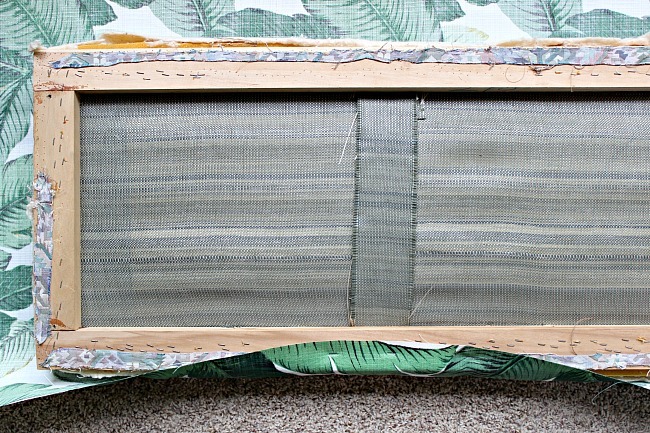 I really never recovered the seat, I had just wrapped the ugly fabric with a new piece and taped it underneath. 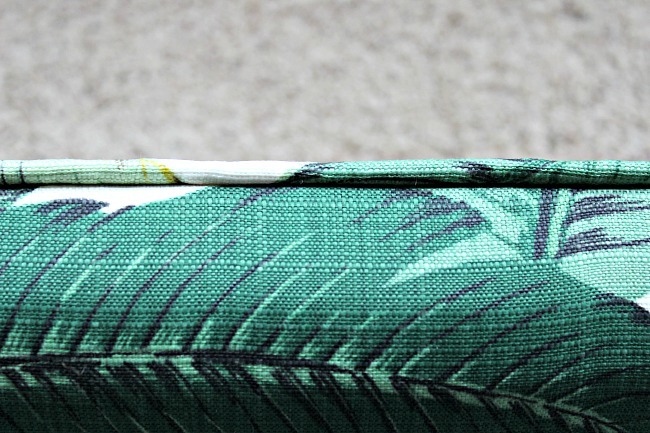 I finally decided where this bench would live, and subsequently what fabric I wanted to use on it. 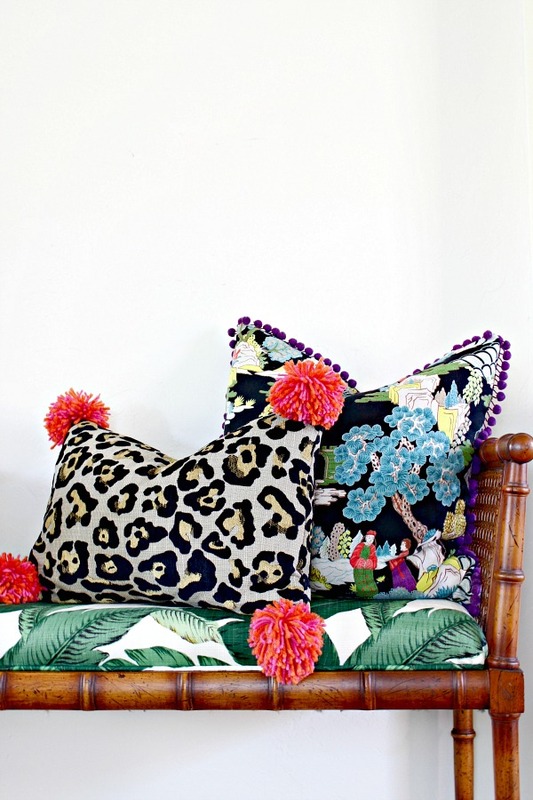 You saw a little peek in my Spring Home Tour, but again, the fabric was just quickly wrapped around the cushion as a temporary fix. 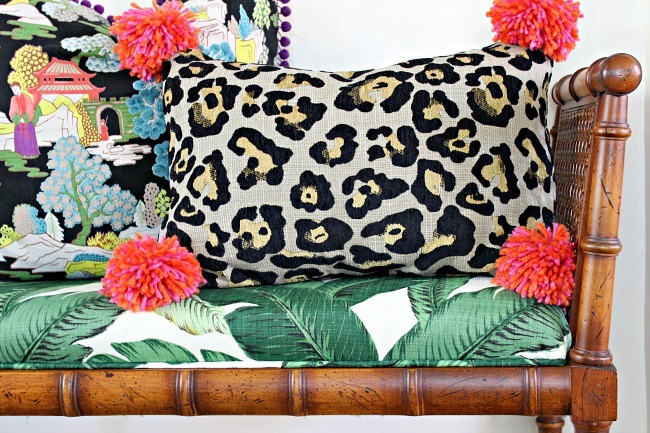 Over the summer I finally had a chance to reupholster the cushion for good. 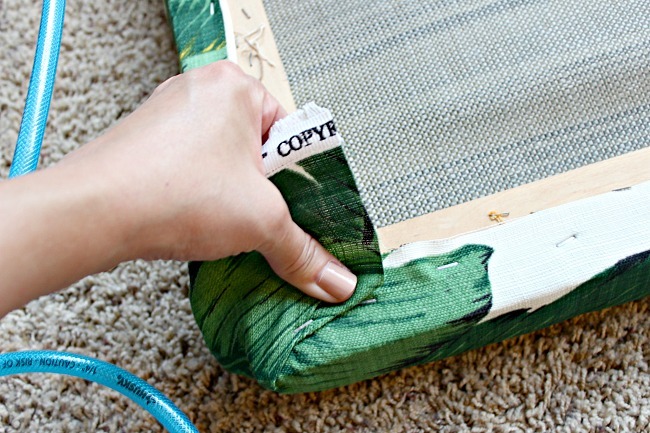 This is a fairly simple project that anyone could do, and the same steps would apply to re-covering a regular seat cushion (such as side chairs or dining chairs). One final step, adding cording around the edge, really gives a more polished, finished look, but that step is completely optional and can be left off if desired. Start by removing the old fabric. Needle nose pliers or a flathead screwdriver can be used to remove staples, but this tool is by far my favorite and I think the easiest to use for loosening staples (then follow-up by pulling staple out with pliers). There were SO many staples in the old fabric that were in really tight, that I actually just trimmed the old fabric off close to the edge of the staples and left them there. That saved a lot of time and elbow grease! 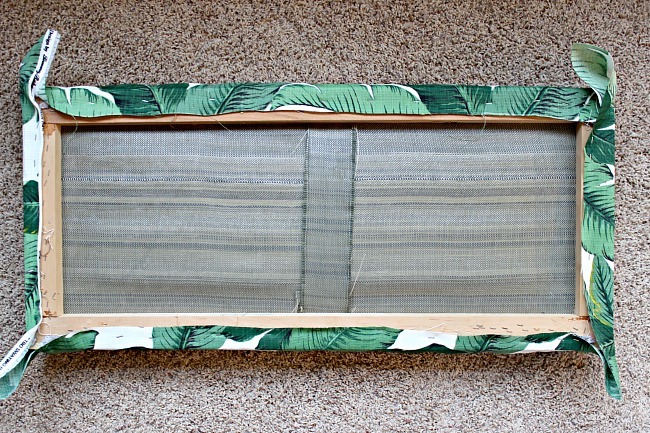 Unless it has a strong odor (like cigarette smoke) or is stained, the batting underneath should be just fine to reuse. 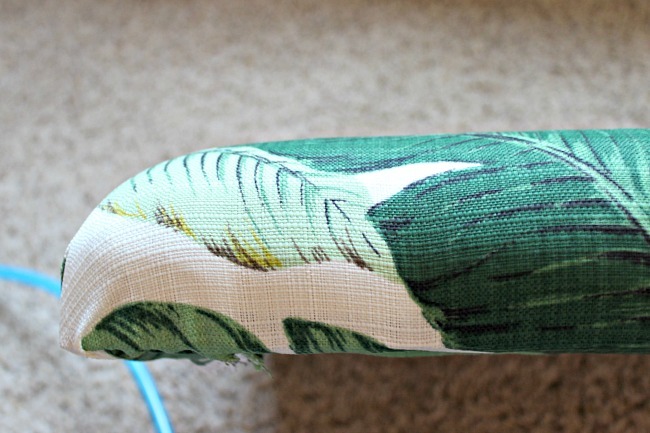 Lay seat base upside down onto wrong side of fabric. 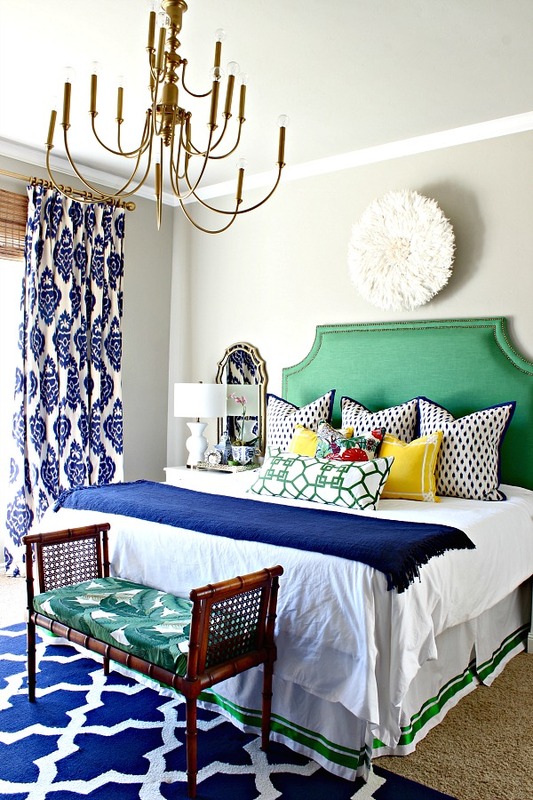 If your fabric has a pattern that needs to be centered, make sure it is lined up correctly and evenly. 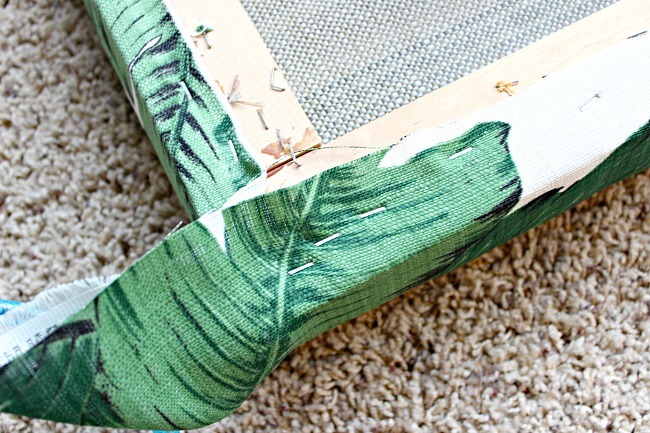 Trim the new fabric so that there is about 6 inches or so all the way around the edge of your cushion (more or less depending on the thickness of your cushion-just make sure there's enough to comfortably wrap around and staple to the underside of the seat frame). 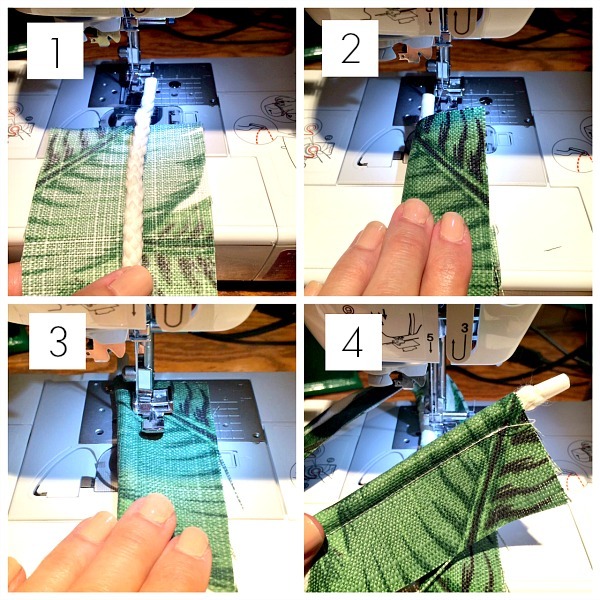 Once again, if your fabric has a pattern, make sure you're mindful of where you're cutting in the design and how the pattern will be centered once you cut. I like to start by putting a few staples into the center of one side. By the way, this is the stapler I like to use with my air compressor. 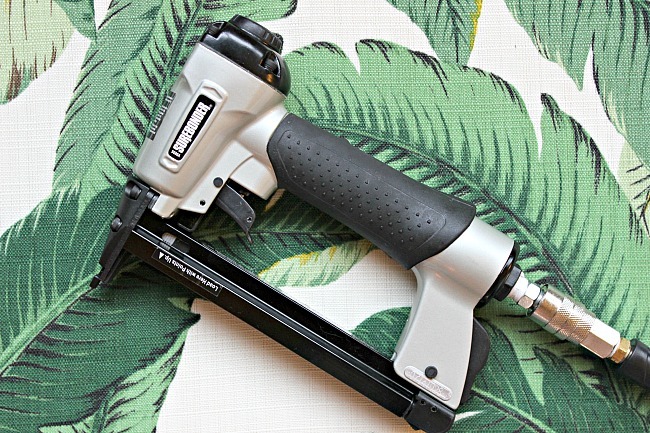 It uses standard staple gun staples that can be purchased at Home Depot or Lowe's, so that's a plus and I never have any trouble with it jamming. The price is right, too! Then, I move to the opposite side, pull tightly, and put a few staples along the center of that side. 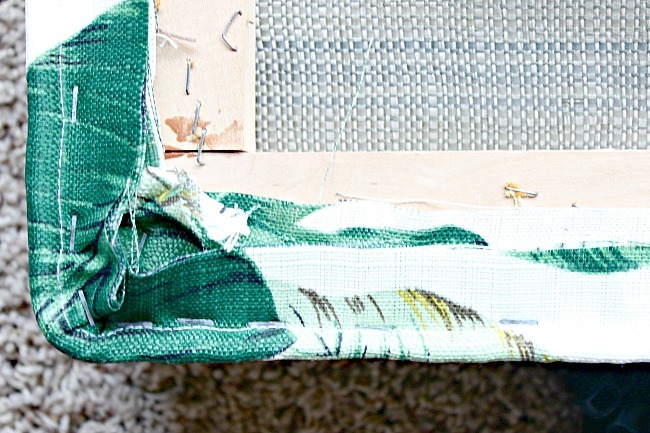 After completing those first few staples, flip seat over and make sure that everything looks straight and centered. 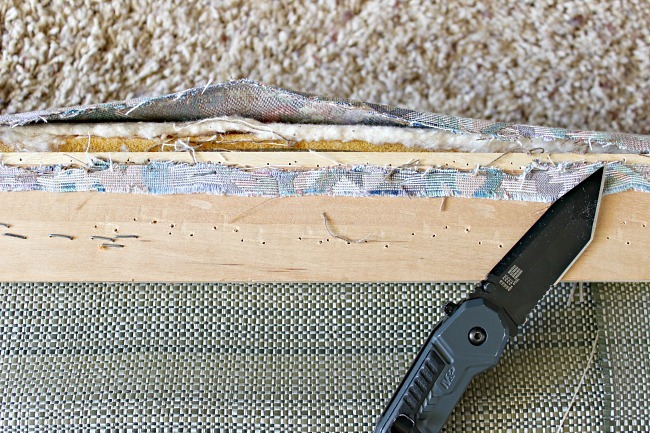 You've only done a few staples, so if the fabric needs to be adjusted it's not a big deal to pop those out and shift the fabric, then re-staple. Trust me from past experience, check how things are looking as you go! Once things look good, staple the remaining two sides in the center as well, pulling fabric tightly as you start each side. Starting from the center staples, work your way out along the rest of the sides, continuing to pull fabric tightly as you staple. Stop a few inches short of each corner. When you're ready for the corners, continue stapling one side almost to the edge. Then, pull the center section up and staple. Finally, pull the last side across tightly and staple. It takes some trial and error to see what will give the smoothest result- staple and pull a little and fold as you go. It helps to trim excess fabric on the corners as you go, also. Now, it's perfectly fine to stop right there and reattach your pretty new seat to the base. BUT, if you want to step it up a notch, add some cording first. It's easy! Here's a quick summary of how to do cording, but I also mentioned it in this post if you want to read up on it a little more. You can buy pre-made decorative cording if there's a color available that coordinates with your fabric, or it's simple to make your own if you want it to match exactly. 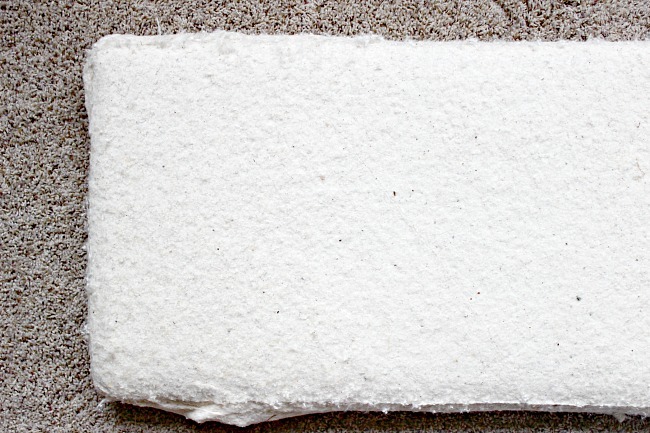 You'll need to cut about a 2-3" wide long strip of fabric from what you have left over. Measure around the bottom edge of your seat cushion, and then add about another 12" just to be sure you have enough. That's the measurement of the long strip of fabric you'll need to make the cording. 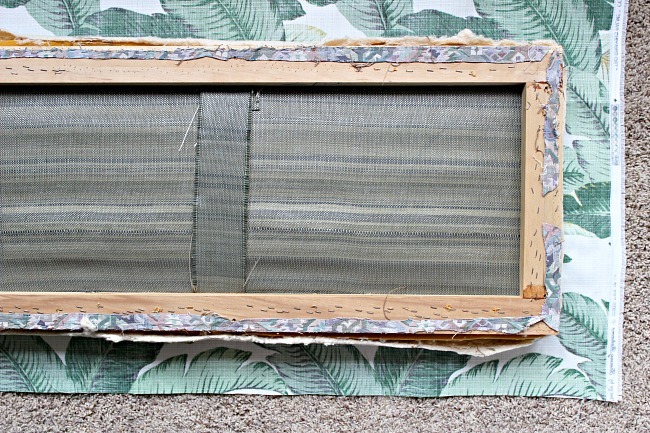 If you don't have long enough strips left, just cut several shorter strips and sew them together end to end, right sides together, until you have one big strip that's long enough. 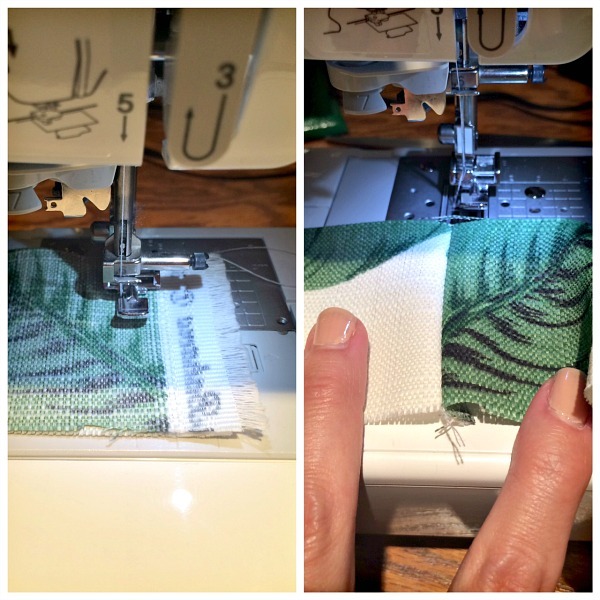 Trim the seam and press open if you've sewn pieces together. 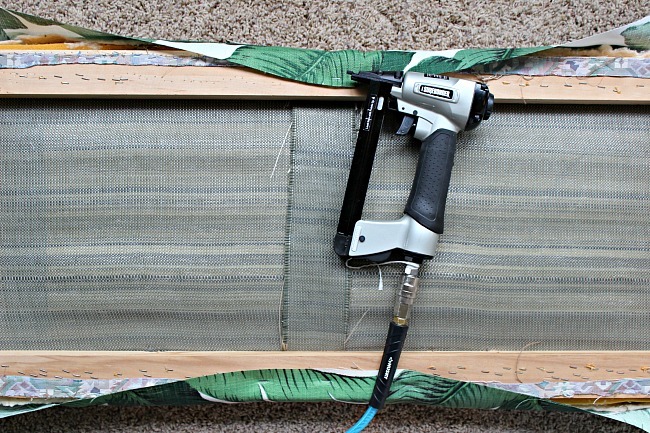 Then, center the cording (simple upholstery cording available at Hobby Lobby, fabric stores, or online here) on the wrong side of your long fabric strip, wrapping the fabric closed tightly around it. 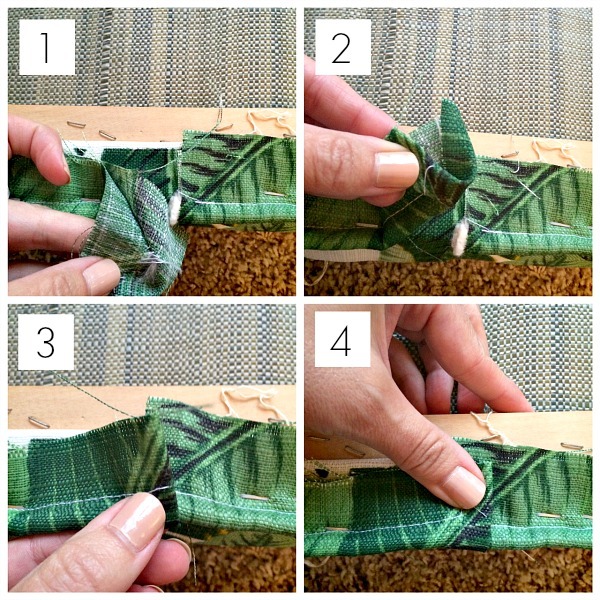 Use your zipper foot to sew very closely along the edge of the cord that's now inside your strip of fabric. 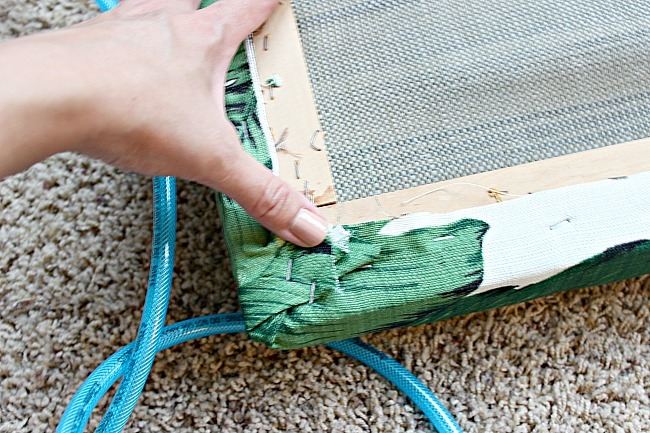 After the cording is finished, staple it along the bottom edge of the seat. Leave a few inches on one end, then staple all along the perimeter. At the point where the ends meet up, peel back the fabric cover and trim the cording so it will meet exactly with where it started. Then, fold fabric edge under so it will be finished and wrap it over the beginning point of the cord. Staple the ends securely. 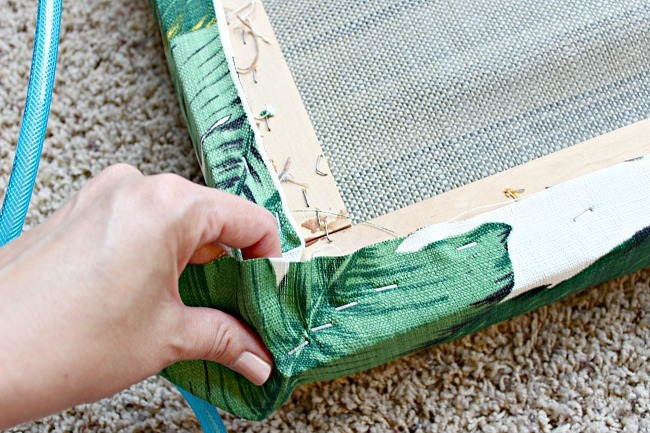 Reattach the cushion to the bench or chair frame, and you're done! 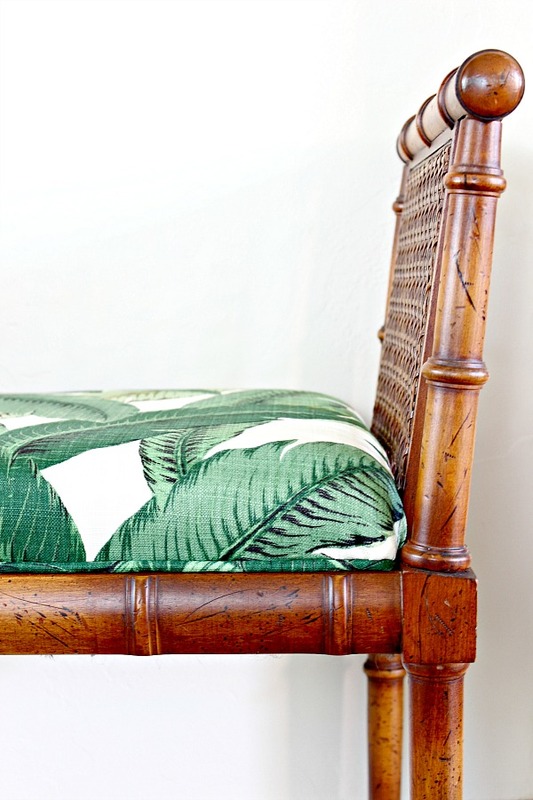 I'll be using this bench at the foot of my bed since the malachite stools are staying put in the living room. It's nice to have it there to have a spot to fold a comforter or blanket back when we're not using it at night. I love that bench so much! 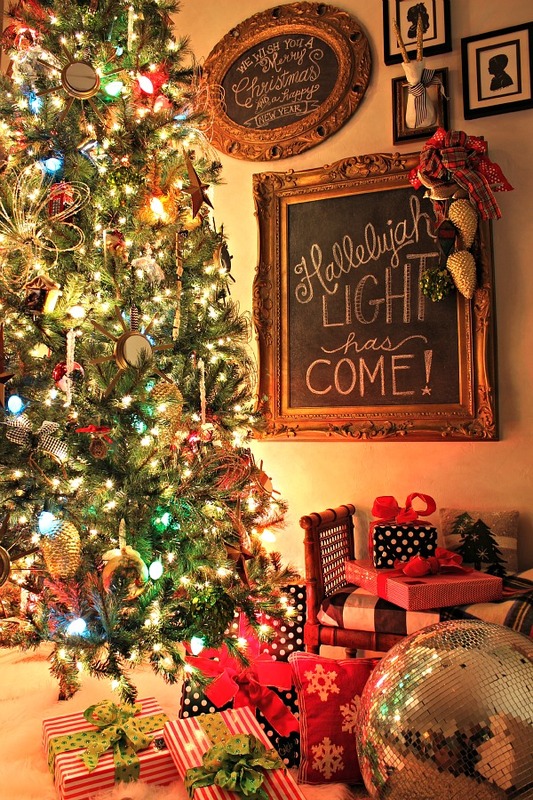 It looks beautiful! Good job. oh that fabric on it is perfect! i had one like it for a while in my room and then replaced it with a flaoting desk in that space. i just love the shape! Gorgeous. Love it and perfect fabric. Fab job and I love the fabric. 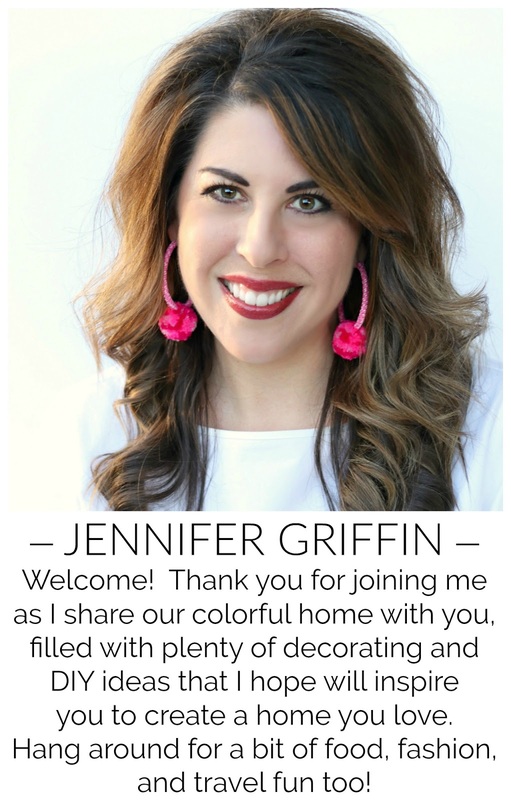 You did such a lovely job, Jennifer! 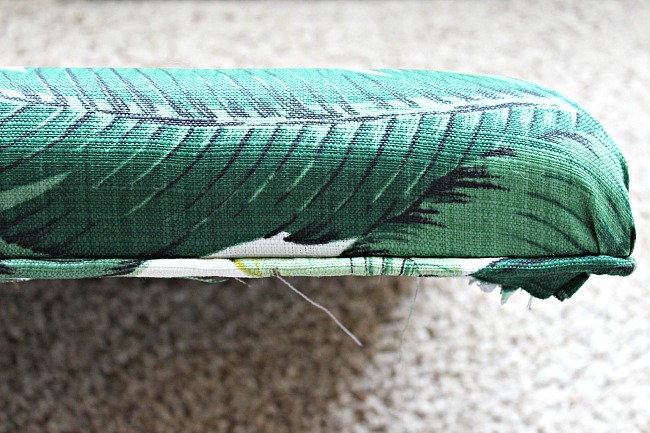 I'm putting a sewing machine on my wishlist - I've stayed away from anything but easy staple reupholstery projects for far too long! I'm looking for a bench and I like yours. Who's the maker or where can I find one? So sorry, I don't see any information on it. I purchased mine from Craigslist. 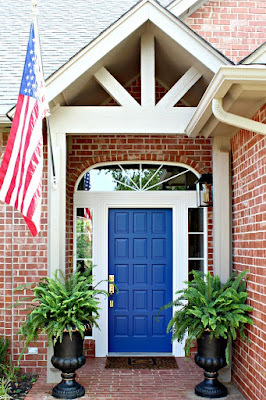 Great idea!!! 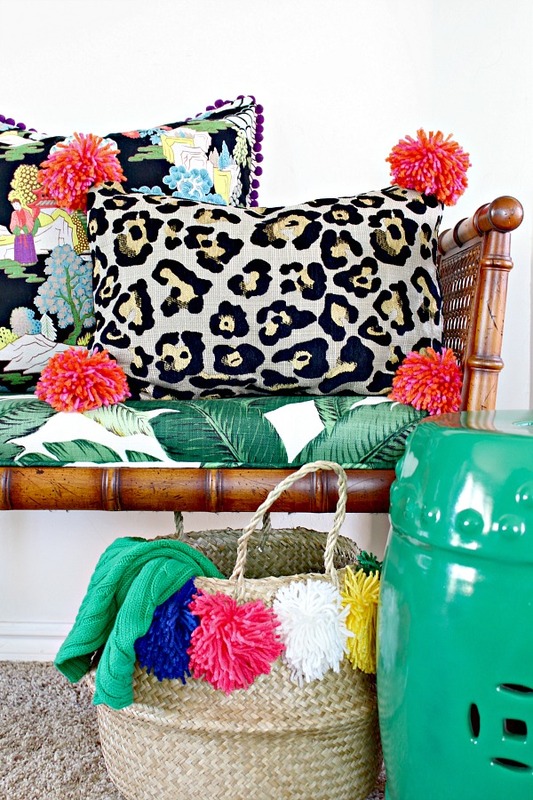 Chair Seat,Bench Seat,Colorful Toile Fabric Pillow, everything Looks gorgeous.Thanks for sharing your idea.